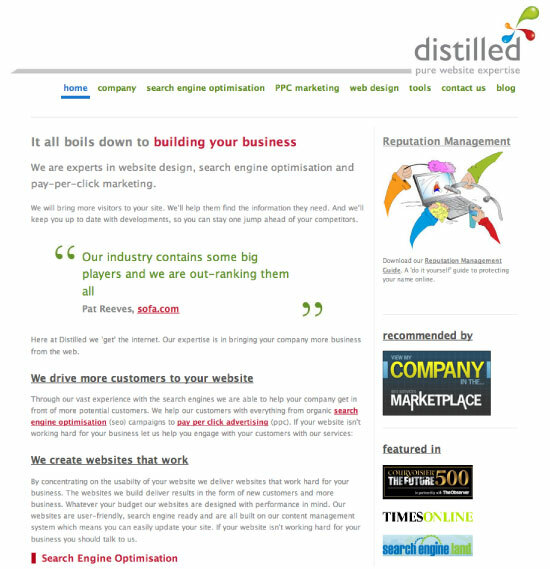 The Distilled website has undergone a few minor (but very important) changes. These changes may not appear to be much visually, but they should make a considerable difference to the website’s usability. Feel free to let us know your thoughts on the change: better, worse, no difference? (If it’s for the worse we hold Dr Pete fully responsible!!! 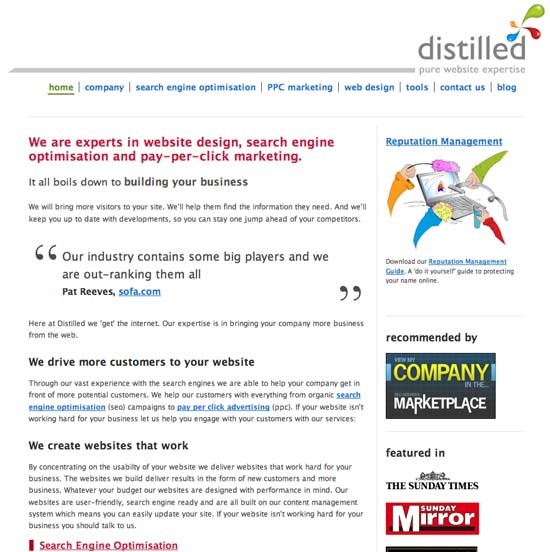 Recently we won a 'Strategic Usability Review' of the distilled website from Dr Pete Meyers by filling in the competition entry form on his website. And we won! This post goes on to explain just how useful the report was. Dr Meyers’ Strategic Usability Review is laid out simply and is consequently easy to read. The only thing that would have made it better for me is a contents page; it's important to let the reader know what is coming next and how many stages of the process there are to read through. The same applies to websites of course, but Dr Pete will know that. The report begins with an introduction to Usability, a comprehensive definition of the subject and a quick guide to reading the report. It is clear from the spatters of humour on the first page that the report is not going to be a dull read, (and even if it was you jolly well should read it as your business could benefit considerably). The next section, a '25-point Usability Checklist', outlines at a glance where there is room for improvement on the website in question. Loading time is the first point of criticism. This is something I have never had a problem with but not everyone is fortunate enough to have a super fast Internet connection and processing speed. So. How can the file sizes within our website be reduced? Here I feel it really is a case of every little helps. One excellent way of decreasing file size is to turn images, wherever possible, from jpg's to gif's. Gif files are customised to only use a limited pallet of colours. For example, the grey infographics we have at the bottom of each page are currently up to 26kb. When re-saved as gif's they are only 4kb – a massive improvement and using only two colours (grey and white). Gif's however dont always look good, they can't be used for photographs or images with complex shapes and many colours. Another area where Dr Pete found room for improvement was with our tag lines. Currently our tag line is 'Pure website expertise', which, as Dr Pete points out, is fine. However, as this doesn't really express very clearly what we do, it is important that other header text on the page does speak more literally. 'It all boils down to building your business': what does this mean anyway? It doesn't tell the reader much at all. The phrases’ ‘SEO’, ‘PPC’ and ‘Website Design’ need to be much more obvious on the home page to help compensate for this. Many of our visitors come via a search engine, not directly, so it is important to think about what they are expecting to find when they reach the distilled home page. Visitors need to be able to see what they want instantly in order to keep the home page abandonment rate to a minimum. Dr Pete also highlighted some problems with our navigation system. This is a relatively serious issue as this menu is the main portal to the rest of the site and could be considerably reducing our click through rate. The colour of the menu is not an instantly click-able link colour. Blue (fortunately, one of our company colours) is much more acceptable for this purpose so we will be using it for click-able text from now on. In an ideal world the menu links would also be underlined but this spoilt the design, so we compromised. After clearly highlighting the website’s problems with a simple tick / cross check list in the review, Dr Pete goes on to condense his findings into a list of 'Usability Trouble Spots'. This section is used to talk more in depth about the main problems on the site. This is simplified further into a 3-point Action Plan in which Dr Pete clearly explains exactly what it is that needs to be changed and advises on what it should be changed to. So did we listen to Dr Pete? Why yes, of course. We didn't even, as he suggested, put the report down and take a nice long walk, muttering to ourselves about what a self-righteous jerk he is!